Athletic activities are a fun way to stay healthy and active. But sports are also responsible for a lot of injuries. 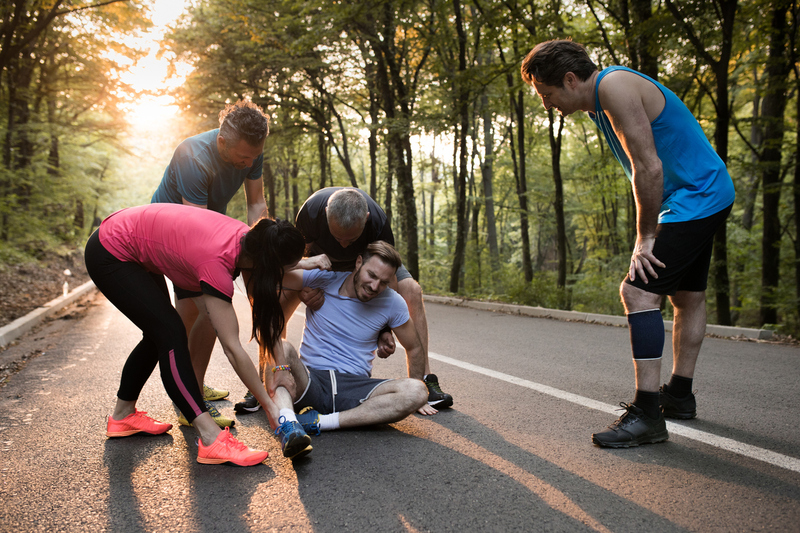 Here are the most common sports injuries and how you can prevent them from happening to you. Concussion – Concussions are a very common sports injury and can have dangerous effects if severe or left untreated. They happen when the head forcibly hits something hard, which can cause swelling in the head. To prevent concussions, athletes should wear the proper safety attire when playing contact sports. For example, this means wearing a helmet every single time you play football – even in practice! Additionally, play carefully. Safety and health come first and although trying your best and pushing yourself are a part of growing as an athlete, taking chances that are too risky can lead to injuries like concussions. Ankle Sprain – An ankle sprain happens when the ankle twists in an awkward way. Ankle sprains can cause mild to moderate pain for a few days or cause a lot of pain and swelling, forcing you to rest for days at a time. To prevent ankle sprains, make sure to stretch before you play. This will help stretch out the muscles and ligaments in the legs and feet, which can help reduce the likelihood or severity of an ankle sprain. Torn ACL – The anterior cruciate ligament (ACL) in the knee is a common ligament to tear while playing sports. When this ligament gets stretched beyond its ability, such as with a certain twist of the leg, it can tear. To prevent ACL tears, maintain a healthy weight so the ligament does not have excessive pressure on it. When the ligament gets tight (after several hours of little movement) it becomes more vulnerable to tears when a sudden twist happens. Make sure to do warm ups and stretches so the ligament can stretch and be flexible before you play your sport. Tennis Elbow – Tennis elbow happens when the tendons in the elbow become inflamed because of overuse. To prevent tennis elbow, avoid repetitive motions with the arms. Take frequent breaks and stretch out your arm muscles and tendons. Do warm ups, stretches, and strength exercises to strengthen the arm’s muscles and tendons. Hamstring Strain – A hamstring sprain happens when the tendons or muscles located in the back of the thigh get injured. To prevent a hamstring strain, make sure to do stretches and warm up activities before playing your sport. This will help loosen up the hamstring so it’s not tight while you play. Additionally, take your time in increasing the intensity at which you play. The hamstring has to get used to the level of intensity you put on it. It’s better to take it slow than injure yourself. Bone Fracture – Bone fractures or breakages happen when too much force is put on a bone, causing it to break. To prevent bone fractures, you should do strengthening exercises to strengthen bones and muscles around them. This will make them stronger and less prone to injury while you play sports. Also, make sure you wear the proper attire and follow the rules of the sport you are playing. Make sure you exercise, run, throw the ball, etc., in the safest way possible. Groin Pull – Groin pulls happen when the muscles located near the groin get strained. To prevent groin pulls, wear proper attire for your sport. For example, wear lose fitting shorts when playing soccer. This will allow your legs to move freely and reduce the chance of a groin pull. Additionally, do stretches and warmups to get your muscles ready for playing. Shin Splint – A shin splint happens when you experience pain in the front side of the lower leg (beginning right below the knee). To prevent shin splints, wear shock-absorbing, supportive, and comfortable shoes. Also, adequately stretch and warm up before playing. Finally, increase intensity gradually. Shin splints can happen when too much pressure is put on the legs too quickly. Back Pain – Back pain is a common sports injury that can occur due to overly strenuous exercise, tackling, and quick and forceful movements. To prevent back pain, make sure you stretch before every activity you do. This will help get your back muscles ready for activity and prevent injuries because of sudden and forceful movement. You should also perform exercises that strengthen the back muscles and accommodate spinal alignment. Dislocations – A dislocation happens when a bone slips out of its joint. The shoulder is one of the most common areas for a dislocation. To prevent dislocations, wear proper safety gear when playing sports. Perform exercises to strengthen your upper body. Also, play safely; dislocations happen when you fall on the joint so the less you fall, the lower your chance of a dislocation. If you play sports and need an orthopedic team by your side for treatment and support, call Total Orthopaedic Care for an appointment today. Their experienced physicians can help you protect yourself from orthopedic sports injuries and provide the most effective treatment if you need it. Call (954) 735-3535 to make an appointment today.